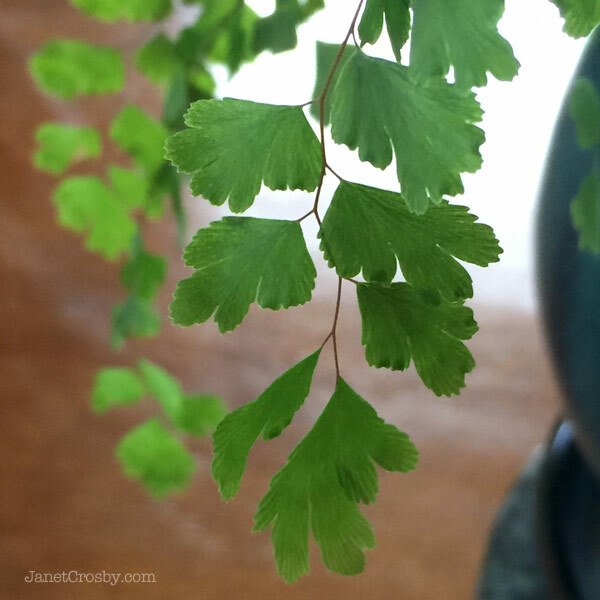 I have loved Maidenhair ferns as long as I can remember. I mean… what’s not to love? Those delicate, yet leafy deliciously green fronds draw my eye every time. These beauties are not carefree, though. They have quite a reputation for being finicky and easy to kill. I felt they were too much plant for me. Until now, I had stuck with hardy, hard-to-kill plants. Then a few months ago, I found one little Maidenhair in my local garden center. The last one. I decided to go for it. Next thing I knew I was checking the soil, misting “Fernie” twice (or more) a day, and Googling for additional care tips for Maidenhair ferns. I was thrilled. My fern was not only surviving but thriving! I upgraded my expanding fern to a nice big pot. All of those beautiful fronds! All over my table! arrrrrgh! That was two counts against the kitties — for fern attack and for being up on the table to do the attack. I did some emergency first aid pruning and watering. Then I took my wounded fern up to my desk to recover far away from the cats. When life gives you shredded Maidenhair fern fronds, I guess you should try to make something pretty out of them. I took the torn fronds and pressed them for future art projects. Then I decided to try and paint something out of this experience. Here are the two first sketches. They are fun to paint! And… dare I say? Is thriving. I had a water globe in this plant. The cats just canNOT resist that glub, blub, blub of the bubbles. I think that initiated the attack. So the globes are now in less dainty plants. But the cats are still mesmerized! Quincy and Barnie hunt the elusive water globe bubbles. I move my fern around the house. (Yeah, cue the Crazy Plant Lady music.) These ferns love bright but indirect light and humidity, so my plant splits time between my desk and the bathroom for humidity. If you made it this far, I have a free fern photo for you! This is a downloadable Maidenhair fern photo that I took of ‘wild’ Maidenhair ferns in downtown Seattle. It is a perfect fit for a phone wallpaper. Don’t you just want to dive right in?